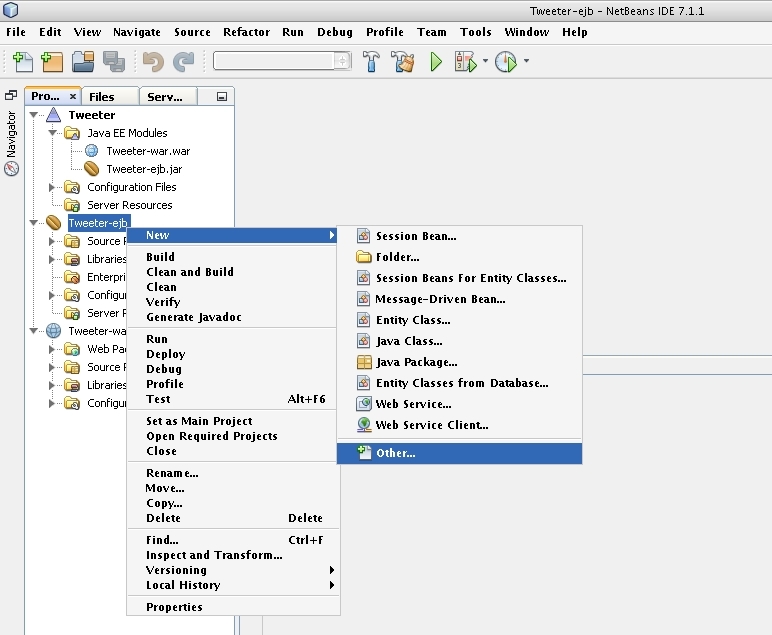 Lets continue building "Online Tweeter Enterprise Application" in NetBeans. 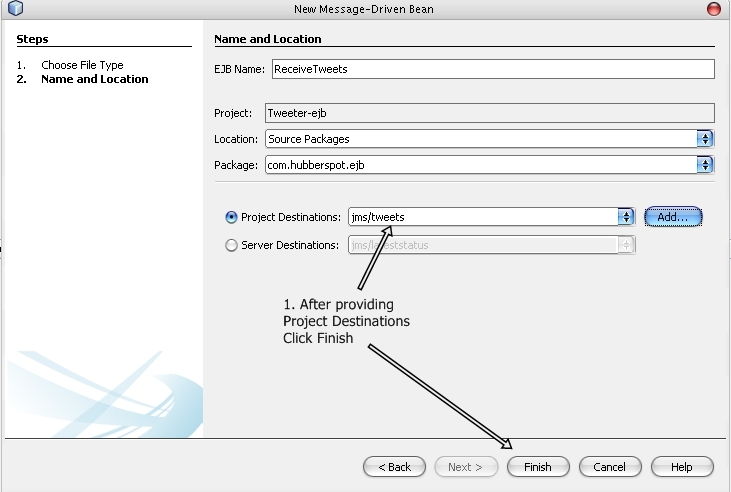 In this section of tutorial, you will create a Message-Driven Bean by name "ReceiveTweets.java". A Message-Driven Bean is a enterprise bean that acts as a JMS message listener which process message coming on the queue or topic over which it is bound to listen. In our "Online Tweeter Enterprise Application" it basically processes and stores the tweets sent by user from the servlet to the queue in database. Step 2: On clicking Other a dialog box appears by name New File. 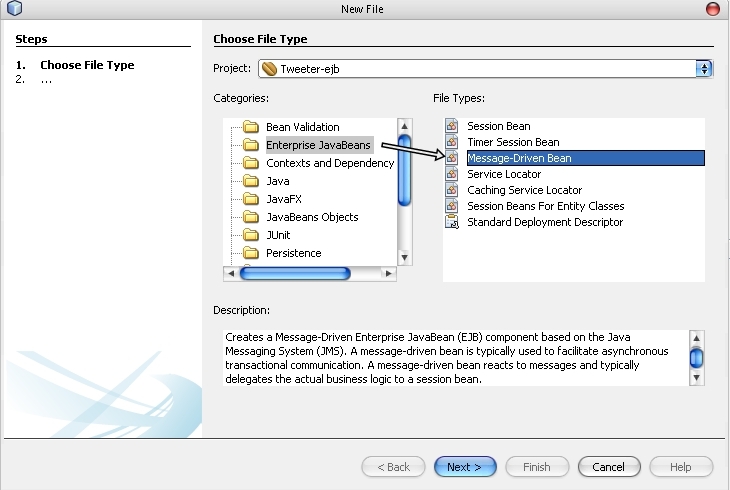 In the Categories: list select Enterprise JavaBeans and in the File Types: select Message-Driven Bean as shown in fig below. New Message-Driven Bean dialog box gets open. It prompts us to enter values for EJB Name: , Project: , Location: , Package: , Project: , Destinations:. Enter the values as per fig below or enter what suits you. Step 4: Click Add button to add a valid message destination. Add Message Destination dialog box gets open. Enter values for Destination Name: and Destination Type: as shown in fig below. Previously opened New Message-Driven Bean dialog box gets open with the values entered for the Project Destinations: as shown in fig below. 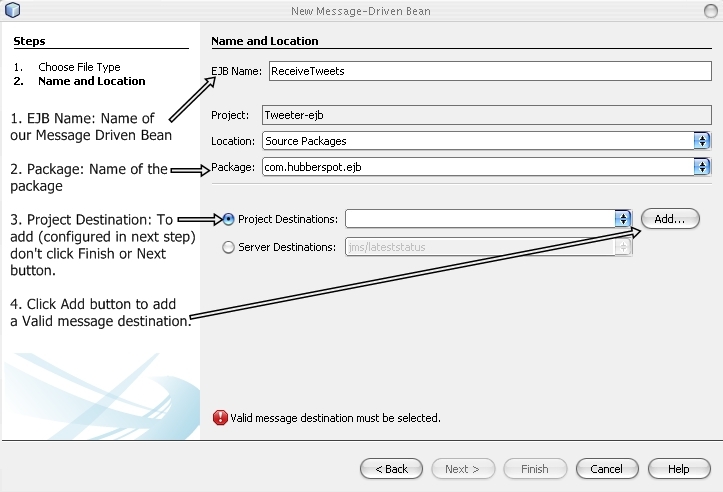 A new Message-Driven Bean gets created by name "ReceiveTweets.java" in the "tweeter-ejb" module in the package provided at the time of creating the bean. It has most of the source code already generated by NetBeans. Kindly add or remove additional code provided below. // this bean is listening. // arrives over the queue. // we intent to use. // such as to persist, merge , load and query objects. // database by EntityManager's persist() method. In the next section of this blog (part 5) you will learn how to create a Stateless Session Bean in NetBeans for this application.